New GHOST & REVOLT prints. 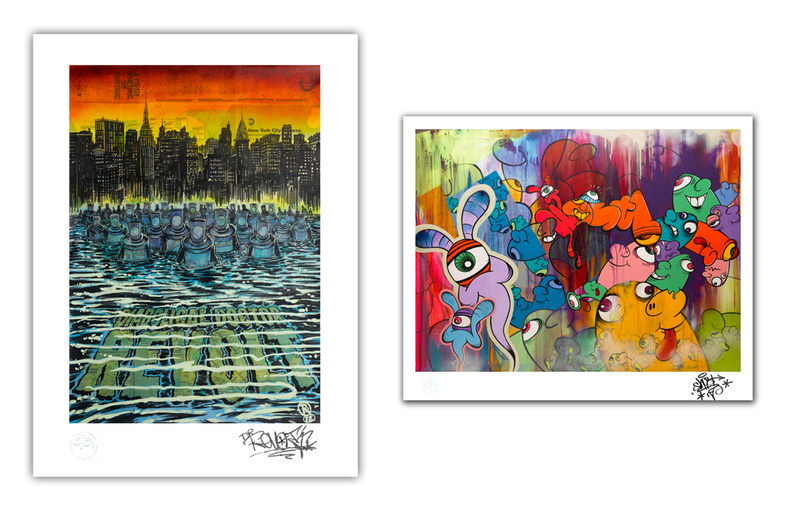 Brand new prints from GHOST ( Cousin Frank) and DR. REVOLT. Both Archival Pigment Prints use Moab Entrada 300 gms art paper. GHOST print titled “GEE’s) is an edition of only 50. Sheet size measures approx 22″× 24″ . Each print is hand signed and numbered by GHOST. DR. REVOLT -New Print , titled ” Advance of the Aerosol Assassins”. is an edition of only 49. Sheet size measures approx 17″× 24″ and is hand deckled on the right side. Each print is hand signed and numbered by DR. REVOLT. ” Advance of the Aerosol Assassins” is one of REVOLTS most popular images. This entry was posted in DP Editions, Whats New. Bookmark the permalink.